Functionality, features, performance and looks. Nice receiver, lots of features, good price point. I purchased this for 449.00 and thought I had a good purchase until I hooked it up. First came the infamous HISS then 18 months later, the remote died. Now in it's fifth year it refuse to respond to commands from the remote? Is five years the LIfe expectancy of this Product? I had mine for 3 years and it just completely died. It had problems from day 1. I had to send it back to the factory to fix a problem with the sub out and couldn't use it for 6 weeks after buying it. I've had lots of problems with JVC products and I think I'll never buy another product from them. JVC AV Compulink - the most simple ease of operation, a four year old can handle it. I have had the 884 for three years now. I have had to take it to the shop once for a blown fuse. Other than that - no problems. The absolute best thing about the thing is the AV Compulink. It operates all of my system with one remote and one push of a button. Hit the power button, the receiver and the TV turn on. Press play for the DVD or VCR and it switches everything for you. Press CD and the onscreen menu pulls up on your screen and you choose which music list you want to play. I have noticed how my 11 year old son will show off the system to his friends. He puts a movie into the DVD tray and closes the tray. Everthing turns on and they're ready to watch. The kids go "Wow, that's so cool!" I have read a lot about noise problems and have never experienced any. I use an Energy Take 5 speaker system with the 10 inch sealed sub and have always been impressed with them for home theater use. With the new plasma sets coming out, I am getting serious about a 50 inch set when JVC has one available with Compulink. I will probably retire the 884 (give it to my son) and by the top of the line JVC replacement. Add a set of Veritas 2.2s and I will be good to go for home theater and music for a few more years. JVC Quality product, no problems after nearly 4 years of use. Decent HT power. Other than lack of DTS, and component video hookups (which weren''t common in ''98) it does have tend to get pretty hot, but still hasn''t effected performance. Bought this unit in mid ''98 to start my HT system. Reciever has been very reliable and runs my Bose AM-10s quite efficiently. JVC does make good quality products (unlike SONY) and they are usually a good value as well. I''ve found the power on this unit quite substantial in HT use, but a little lacking in stereo use. The DSP processing leaves a lot to be desired though, and the unit does not switch into Dolby Digital/Surround modes automatically so you have to go hit the "Mode" button on the reciever (The remote lacks this as well!). Unit is pre-DTS which would have been nice feature to have. If I only knew what I know now back then, I would have waited for DTS recievers to have become available (another six months). Unit also does not contain composite video inputs for HDTV/Progressive Scan. Still unit has performed without any problems and given me nearly four years of problem free usage which I cannot say for my previous Sony reciever. This is my second JVC reciever (I owned a stereo reciever I bought new in ''77 and yes, it plays as good as the day I bought it as well!). ''77 JVC Stereo Reciever - Still have, still working! ''89 Kenwood Stereo Reciever - Ex-wife, still working! ''96 Sony AV Reciever R.I.P. - Died in ''97, one week after warranty expired! I purchased this unit over my previous brand (Kenwood) because of looks and S-Video input/output. Receiver works flawlessly. No sync rolls in the video out as I had with Kenwood. Multi-function programmable remote eliminated the need for 3 others. One very nice feature was the ability to change the association of the optical audio in to specific video inputs. This unit has 3 oprical inputs (2 opt. 1 coax)For the money I could not find a unit with more features. Lack of Power. Bad subwoofer output. I submitted an earlier review for this product when my product was in need of repair. I finally shipped the product to a jvc factory and they fixed everything. 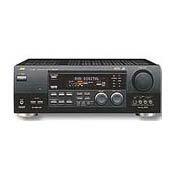 I agree with most reviews that state the power is weak for a receiver advertiesed at 110x5. I also agree that the subwoofer output is screwy. I've connected a couple of subwoofers to this receiver and I occasionaly get a bad feedback/hiss type noise. I suspect there may be a grounding problem with the receiver, but I've never been shocked by it. Also the subwoofer volume changes from device to device. I've owned aboout 5 mid to low quality receivers and the sound quality is about average. The thing I like best about this receiver is that I can hook both my dvd player and Dish network reciever so they use s-video and toslink. I havn't found another receiver that allows this. Usually, the toslink connections are paired with video that is not s-video. After using this receiver for about 6 months, I think this receiver is somewhat average in quality and above average in the features you get for the price. Not bad for Dolby Digital. I have been using this JVC for about a year now. Overall the unit is average. If your looking for a reciever that will play music loud DO NOT BUY THIS. If you are looking for a surround sound reciever this is the best bang for your buck. I am an avid movie watcher who likes to jam out with the ocassional CD. This reciever is not good for listening to music. It does not have enough power to "Jam Out". The sub pre-out is all screwed up. It doesn't work well with any powered sub I've tried. I do love the way it sounds in Dolby Digital though. And I think the features are nice. But you can definitly do better if you do your shopping around. Check out Denon for the best sound. Very nice Dolby Digital 5.1 Sound. Easy Control. Nice and fully functional remote control unit. I bought this product as referbushed device from an auction in Amazon.com, it was a very good dicision, many of my friends bought the same unit after seeing the performance. The 5.1 Dolby Digital is really nice ! !